The Bay of Fundy (or Fundy Bay; French: Baie de Fundy) is a bay between the Canadian provinces of New Brunswick and Nova Scotia, with a small portion touching the US state of Maine. It has an extremely high tidal range. Portions of the Bay of Fundy, Shepody Bay and Minas Basin, form one of six Canadian sites in the Western Hemisphere Shorebird Reserve Network, and are classified as a Hemispheric site. It is administered by the provinces of New Brunswick and Nova Scotia, and the Canadian Wildlife Service, and is managed in conjunction with Ducks Unlimited Canada and the Nature Conservancy of Canada. Some sources believe the name "Fundy" is a corruption of the French word Fendu, meaning "split", while others believe it comes from the Portuguese funda, meaning "deep". The bay was also named Baie Française (French Bay) by Samuel de Champlain during a 1604 expedition to St. Croix Island. 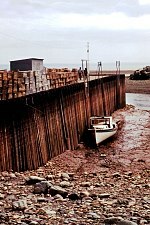 The Bay of Fundy has a high tidal range. Oceanographers attribute it to tidal resonance resulting from a coincidence of timing: the time it takes a large wave to go from the mouth of the bay to the inner shore and back is practically the same as the time from one high tide to the next. During the 12.4-hour tidal period, 115 billion tonnes of water flow in and out of the bay. According to the Canadian Hydrographic Service, there is a 16.8-metre (55-foot) tidal range in Leaf Basin for Ungava Bay and 17 metres (56 feet) at Burntcoat Head for the Bay of Fundy. The range at Leaf Basin is higher on average than at Minas Basin; however, the highest recorded tidal ranges ever measured are at Burntcoat Head and result from spring tides measured at the peak of the tidal cycle, which occurs every 18 years. The highest water level ever recorded in the Bay of Fundy system occurred at the head of the Minas Basin on the night of October 4–5, 1869 during a tropical cyclone named the "Saxby Gale". The water level of 21.6 metres (71 feet) resulted from the combination of high winds, abnormally low atmospheric pressure, and a spring tide. Alternative forms of energy are being explored in depth in a number of unique areas. Tidal energy harnesses the movement of ocean water to generate electricity through a number of mechanisms. A process of gathering tidal energy called "In-stream turbine technology" is being tested in the Minas Passage, Nova Scotia. This project is being spearheaded by the Fundy Ocean Research Centre for Energy or FORCE. A megawatt-scale turbine was installed at Cape Sharp near Partridge Island in November 2016. Its owner, Open Hydro, went into insolvency in August 2018; the project is thus finished. The Bay of Fundy lies in a rift valley called the Fundy Basin; as the rift began to separate from mainland North America, volcanic activity occurred, forming volcanoes and flood basalts. These flood basalts poured out over the landscape, covering much of southern Nova Scotia. Sections of the flood basalts have been eroded away, but still form a basaltic mountain range known as North Mountain. As a result, much of the basin floor is made of tholeiitic basalts giving its brown colour. The rift valley eventually failed (see aulacogen) as the Mid-Atlantic Ridge continued to separate North America, Europe, and Africa. The upper part of the bay splits into Chignecto Bay in the northeast and the Minas Basin in the east. Chignecto Bay is further subdivided into Cumberland Basin and Shepody Bay and the extreme eastern portion of Minas Basin is called Cobequid Bay. Some of these upper reaches exhibit exposed red bay muds, for which the Bay of Fundy is noted (for their appearance and biological productivity). Cape Chignecto, as viewed from the Visitor Centre at Cape Chignecto Provincial Park. Cape Chignecto defines Chignecto Bay whereas Cape Split defines the Minas Channel, leading to the Minas Basin. The Minas Channel connects the Minas Basin with the main body of the bay. The channel is 5.6 kilometres (3.5 mi) across and approximately 106.7 metres (350 ft) deep. The tides that flow through the channel are very powerful. They are as powerful as 8,000 train engines or 25 million horses. Facing Cape Split at the entrance to the Minas Channel are the basalt cliffs of Cape d'Or. The Minas Basin in early May. The lower part of the bay is also home to four important sub-basins: Passamaquoddy Bay and Back Bay on the New Brunswick shore, Cobscook Bay on the Maine shore, and the Annapolis Basin on the Nova Scotia shore. 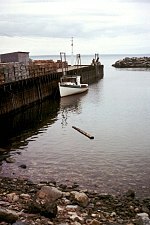 The bay is home to several islands, the largest of which is Grand Manan at the boundary with the Gulf of Maine. Other important islands on the north side of the bay include Campobello Island, Moose Island, and Deer Island in the Passamaquoddy Bay area. Brier Island and Long Island can be found on the south side of the bay while Isle Haute is in the upper bay off Cape Chignecto. Smaller islands and islets also exist in Passamaquoddy Bay, Back Bay, and Annapolis Basin. The Five Islands, in the Minas Basin, are particularly scenic. The Bay of Fundy is also home to another interesting geologic feature, the Hopewell Rocks formation. This formation is where the "famous flower-pot rocks" are located on a short, one kilometre-long portion of shore along Shepody Bay. These rocks are shaped by the tides, the strength of the rocks, and the presence of the joints in the rocks. The rock in the cliffs, from which the stacks are being cut, are arkosic sandstone and coarse, poorly sorted conglomerates. The tides that are eroding the cliffs are between 10.7 metres (35 ft) and 14.7 metres (48 ft) high on average. 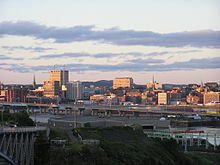 Near the mouth of the Saint John River, where it passes through the city of Saint John, is the famous Reversing Falls. Here the changing tide causes alternating strong upriver and downriver flows several times a day as the tidal cycle changes. A narrow granite gorge and rocky bottom heavily restricts waterflow and creates strong rapids that flow upriver at high tide, and downriver at low tide. 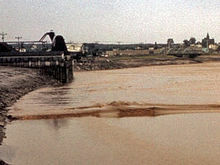 Another phenomenon which occurs in these rivers of the upper bay is a "tidal bore", where a wave front of water "bores" its way up a river against its normal flow. The narrow and shallow river estuaries around the upper Bay of Fundy regularly produce bores when the advancing tide is slowed by shallow waters creating a build-up with a steep surge of advancing water. Tidal bores are found on the Salmon River at Truro, the Petitcodiac River at Moncton as well as on the Shubenacadie River, the St. Croix River, the Maccan River, Kennetcook River and at River Herbert. The largest population centre on the bay is the New Brunswick city of Saint John. Saint John is the port city of the Bay of Fundy. The port is Canada's third largest port by tonnage with a cargo base that includes dry and liquid bulk, break bulk, containers, and cruise. Saint John is the oldest incorporated city in Canada. During the reign of George III, the municipality was created by royal charter in 1785 by a union between the former towns on each side of the harbour, Parrtown and Carleton. The New Brunswick towns of St. Andrews, Blacks Harbour, St. Martins and Sackville as well as the Nova Scotia towns of Amherst, Parrsboro, Truro, Windsor, Wolfville, Annapolis Royal, and Digby are also on the bay. Approximately seventy-five years after Port Royal was founded, Acadians migrated from the capital and established what would become the other major Acadian settlements: Grand-Pré, Chignecto, Cobequid (present-day Truro, Nova Scotia) and Pisiguit (present-day Windsor, Nova Scotia). Fort Edward (built 1750), Windsor, Nova Scotia. The oldest blockhouse in North America. There were numerous naval battles as well as naval attacks on the settlements surrounding the Bay of Fundy. Port Royal was raided numerous times during the Acadian Civil War. After the English took over this area, they expelled the many Acadians who refused to take a loyalty oath to their rule. During the American Revolution in the late eighteenth century, American privateers raided the English villages along the shores of the Bay of Fundy, such as the Raid on St. John (1775), the Battle off Cape Split and the Raid on Annapolis Royal (1781). After the War, the boundary between the United States and the newly created province of New Brunswick remained uncertain, resulting in a thriving smuggling trade in the region, especially on the waters of Passamaquoddy Bay. The War of 1812 resulted in actions on the Bay of Fundy, mostly in the form of privateering and small patrol ships. After the War of 1812, the smuggling resumed and culminated in the so-called "plaster war" of 1820. The Bay of Fundy's ports and basins became major shipbuilding and shipping centres in the 19th century. Led at first by shipbuilders such as James Moran of St. Martins, New Brunswick, shipbuilding spread to all shores of the Bay of Fundy. Shipbuilders such as Joseph Salter in Moncton and William D. Lawrence of Maitland, Nova Scotia constructed some of the largest sailing ships ever built in Canada. Among other accomplishments, Fundy ports produced the fastest ship in the world, the ship Marco Polo; the largest wooden ship ever built in Canada, the ship William D. Lawrence; and the first female sea captain in the western world, Molly Kool of Alma, New Brunswick. The fabled mystery ship Mary Celeste was also built on the Bay. The port of Saint John gives access to the pulp and paper industry and the Irving oil refinery. Hantsport, Nova Scotia, on the Avon River is also home to a pulp and paper mill and is the shipment point for raw gypsum exports to the United States. The ports of Bayside, Charlotte County, (near St. Andrews) and Eastport, Maine, are important local ports. Point Wolfe at Fundy National Park. A number of parks preserve and interpret the Bay of Fundy's coastal ecosystem. They include Fundy National Park in New Brunswick and Cape Chignecto Provincial Park and Five Islands Provincial Park and Blomidon Provincial Park in Nova Scotia. The Canadian Wildlife Service maintains a number of National Wildlife Areas in the Bay of Fundy including a proposed designation of Isle Haute in the middle of the Bay. The Fundy Trail extends from the Fundy Trail Parkway at Big Salmon River to Fundy National Park. Central Nova Tourist Association – Tourism Association Representing Cumberland and Colchester County. ^ "Description". Western Hemisphere Shorebird Reserve Network. Retrieved February 18, 2008. ^ Garrett, Chris; Koslow, Tony; Singh, Rabindra (March 25, 2015) [July 8, 2010]. "Fundy, Bay of and Gulf of Maine". The Canadian Encyclopedia (online ed.). Historica Canada. ^ Slocum, Victor (1993) . Capt. Joshua Slocum. New York: Sheridan House. pp. 27–28. ISBN 0-924486-52-X. ^ "Teaching & Learning about Canada". Archived from the original on August 20, 2007. Retrieved September 26, 2007. ^ Yeo, R.K.; Risk, M.J. (March 1, 1981). "The sedimentology, stratigraphy, and preservation of intertidal deposits in the Minas Basin System, Bay of Fundy". Journal of Sedimentary Petrology. 51 (1): 245–260. doi:10.1306/212F7C5C-2B24-11D7-8648000102C1865D. ^ a b Klein, George DeVries (December 1, 1963). "Bay of Fundy intertidal zone sediments". Journal of Sedimentary Petrology. 33 (4): 844–854. doi:10.1306/74D70F5B-2B21-11D7-8648000102C1865D. ^ "Tides in the Bay of Fundy". Bay of Funding Tourism Partnership. Archived from the original on April 9, 2010. Retrieved January 24, 2019. ^ "Annual Report 2012" (PDF). Fundy Ocean Research Center for Energy. 2012. pp. 1–25. Retrieved January 24, 2019. ^ "The Fundy Ocean Research Center for Energy" (PDF). FORCE (Brochure). Bay of Fundy, Nova Scotia, Canada: The Fundy Ocean Research Center for Energy. May 2012. Retrieved December 9, 2013. Imagine the power of the highest tides in the world. Imagine the technology to harness it. ^ Trenhaile, A.S.; Pepper, D.A. ; Trenhaile, R.W. ; Dalimonte, M. (December 4, 1998). "Stacks and Notches at Hopewell Rocks, New Brunswick, Canada". Earth Surface Processes and Landforms. 23 (11): 975–988. doi:10.1002/(SICI)1096-9837(1998110)23:11<975::AID-ESP916>3.0.CO;2-K.
^ Dalton, F.K. (1951). "Fundy's prodigious tides and Petitcodiac's tidal bore". Journal of the Royal Astronomical Society of Canada. XLV: 225–231. ^ "Saint John". Canadian Encyclopedia. Retrieved June 12, 2017. ^ Faragher, John Mack (2005). A Great and Noble Scheme: The Tragic Story of the Expulsion of the French Acadians from Their American Homeland. W.W Norton & Company. pp. 110–112. ISBN 978-0-393-05135-3. 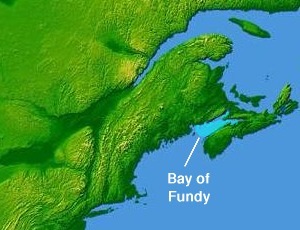 Wikimedia Commons has media related to Bay of Fundy. Wikivoyage has a travel guide for Bay of Fundy. Wikisource has the text of the 1911 Encyclopædia Britannica article Fundy, Bay of.